A Placebo-Controlled Double-Blind Study Demonstrates the Clinical Efficacy of a Novel Herbal Formulation for Relieving Joint Discomfort in Human Subjects with Osteoarthritis of Knee. LI73014F2 is a novel composition prepared from extracts of Terminalia chebula fruit, Curcuma longa rhizome, and Boswellia serrata gum resin with synergistic benefit in 5-Lipoxygenase (5-LOX) inhibition. This herbal composition with strong anti-5-LOX activity exhibited significant pain relief as indicated through improvements in weight-bearing capacity in a monosodium iodoacetate-induced osteoarthritis (OA) model of Sprague-Dawley rats. A 90-day randomized, placebo-controlled double-blind study evaluates the clinical efficacy and tolerability of LI73014F2 in the management of symptoms of OA of the knee (Clinical Trial Registration No. CTRI/2014/01/004338). Subjects, (n = 105), were randomized into three groups: placebo (n = 35), 200 mg/day of LI73014F2 (n = 35), and 400 mg/day of LI73014F2 (n = 35). All study participants were evaluated for pain and physical function by using standard tools, that is, Visual Analog Scale, Lequesne's Functional Index, and Western Ontario and McMaster Universities Osteoarthritis Index (WOMAC) at the baseline (day 0) and on day 14 ± 3, 30 ± 3, 60 ± 3, and at the end of the study (day 90 ± 3). In addition, routine examinations on biochemical parameters in serum, urine, and hematological parameters were conducted on each visit to assess the safety of the study material. At the end of the trial period, LI73014F2 conferred significant pain relief, improved physical function, and quality of life in OA patients. In conclusion, preclinical and clinical data together strongly suggest that the herbal formulation LI73014F2 is a safe and effective intervention for management of joint discomfort, demonstrating efficacy as early as 14 days. J Med Food. 2018 May;21(5):511-520. Efficacy of curcumin and Boswellia for knee osteoarthritis: Systematic review and meta-analysis. PURPOSE: The unfavorable safety profiles of commonly prescribed knee osteoarthritis (OA) treatments have led clinicians and patients to seek safer alternatives. Research has suggested that curcuminoid and boswellia formulations could moderate key inflammatory pathways that are associated with worsening symptoms and disease progression. We conducted a systematic review and meta-analysis to assess the efficacy and safety of these treatments vs. placebo or NSAIDs for knee OA. METHODS: We searched Medline, EMBASE, Google Scholar, Web of Science and the Cochrane database from inception to February 21, 2018. We also hand searched reference lists and reviewed conference proceedings. We included randomized clinical trials (RCTs) comparing curcuminoid or boswellia formulations with placebo or NSAIDs for knee OA. We calculated standardized mean differences (SMD) or risk ratios (RR) for all relevant outcomes. Meta-analyses were conducted using random effects models. Heterogeneity was assessed using the I statistic. RESULTS: Eleven RCTs (N = 1009) were eligible for analysis. Study quality was low overall, and most included RCTs were conducted on fewer than 100 participants. Both curcuminoid and boswellia formulations were statistically significantly more effective than placebo for pain relief and functional improvement. There were no significant differences between curcuminoids or boswellia and placebo in safety outcomes. Curcuminoids showed no statistically significant differences in efficacy outcomes compared to NSAIDs; patients receiving curcuminoids were significantly less likely to experience gastrointestinal adverse events. 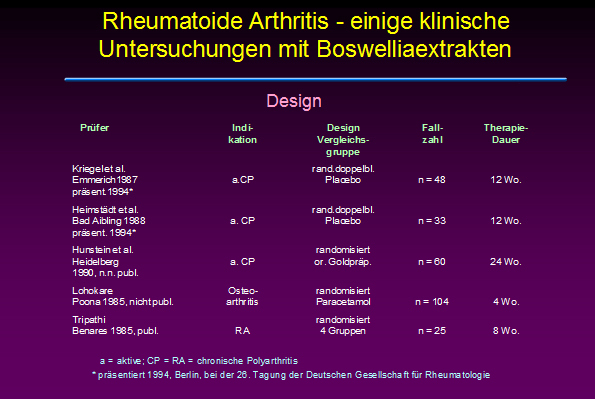 No RCTs compared boswellia against approved NSAIDs. CONCLUSIONS: The results of our study suggest that curcuminoid and boswellia formulations could be a valuable addition to the knee OA treatment regimens by relieving symptoms while reducing safety risks. The current body of evidence is not adequate in size or quality to make any meaningful clinical practice recommendations. Further research through large, high quality RCTs probably investigating the synergistic effect of these products with other OA treatments is warranted. Semin Arthritis Rheum. 2018 Mar;():. BACKGROUND: Curcumin is a powerful anti-oxidant that can be used to treat inflammation and pain in chronic conditions such as osteoarthrosis (OA). Phytoproflex® is characterized by an innovative delivery system that improves bioavailability of curcuminoids and could be useful in the management of OA. METHODS: This 4-week registry included 56 patients with knee OA treated according to the best standard management for symptomatic OA. On top of that, 24 patients used Phytoproflex® supplement preparation (an extract containing boswellic acid 90%, curcumin 20% and valeric acid 0.8%). Patients' control of symptoms and functional capacity were evaluated through the Karnofsky Scale and standardized treadmill test, together with measurement of oxidative stress levels and use of rescue medication. RESULTS: No problems of tolerability or safety were reported among subjects using the supplement. After 4 weeks, patients treated with the supplement reported a significant decrease in pain (P<0.05), and a significant improvement in the fitness scale (P<0.05), indicating that subjects were able to perform normal daily tasks. Less subjects in the supplement group had to use rescue medication (P<0.05), while oxidative stress levels, which were high at inclusion, significantly decreased in both groups (P<0.05). Moreover, the variation in pain-free walking distance and the Karnofsky Scale were significantly more improved (P<0.05) in patients taking the supplement compared to controls. CONCLUSIONS: This preliminary registry study indicates that Phytoproflex® can be safely used as an effective, supplementary management in most OA patients. BACKGROUND: The aim of this clinical trial was to assess the efficacy and safety of curcuminoid complex extract from turmeric rhizome with turmeric volatile oil (CuraMed®) and its combination with boswellic acid extract from Indian frankincense root (Curamin®) vs placebo for the treatment of 40- to 70-year-old patients with osteoarthritis (OA). METHODS: The effects of CuraMed® 500-mg capsules (333 mg curcuminoids) and Curamin® 500-mg capsules (350 mg curcuminoids and 150 mg boswellic acid) taken orally three times a day for 12 weeks in 201 patients was investigated in a three-arm, parallel-group, randomized, double-blinded, placebo-controlled trial. Primary outcome efficacy measures included OA physical function performance-based tests, the WOMAC recommended index of joint pain, morning stiffness, limitations of physical function, and the patients' global assessment of disease severity. RESULTS: Favorable effects of both preparations compared to placebo were observed after only 3 months of continuous treatment. A significant effect of Curamin® compared to placebo was observed both in physical performance tests and the WOMAC joint pain index, while superior efficacy of CuraMed vs placebo was observed only in physical performance tests. The effect size compared to placebo was comparable for both treatment groups but was superior in the Curamin® group. The treatments were well tolerated. CONCLUSIONS: Twelve-week use of curcumin complex or its combination with boswellic acid reduces pain-related symptoms in patients with OA. Curcumin in combination with boswellic acid is more effective. Combining Curcuma longa and Boswellia serrata extracts in Curamin® increases the efficacy of OA treatment presumably due to synergistic effects of curcumin and boswellic acid. TRIAL REGISTRATION: This trial is registered at the database www.clinicaltrials.gov . https://clinicaltrials.gov/ct2/show/NCT02390349?term=EuroPharma&rank=1 . Study registration number: NCT02390349 . BMC Complement Altern Med. 2018 Jan;18(1):7. OBJECTIVE: To investigate the efficacy and safety of dietary supplements for patients with osteoarthritis. DESIGN: An intervention systematic review with random effects meta-analysis and meta-regression. DATA SOURCES: MEDLINE, EMBASE, Cochrane Register of Controlled Trials, Allied and Complementary Medicine and Cumulative Index to Nursing and Allied Health Literature were searched from inception to April 2017. STUDY ELIGIBILITY CRITERIA: Randomised controlled trials comparing oral supplements with placebo for hand, hip or knee osteoarthritis. RESULTS: Of 20 supplements investigated in 69 eligible studies, 7 (collagen hydrolysate, passion fruit peel extract, extract, extract, curcumin, pycnogenol and L-carnitine) demonstrated large (effect size >0.80) and clinically important effects for pain reduction at short term. Another six (undenatured type II collagen, avocado soybean unsaponifiables, methylsulfonylmethane, diacerein, glucosamine and chondroitin) revealed statistically significant improvements on pain, but were of unclear clinical importance. Only green-lipped mussel extract and undenatured type II collagen had clinically important effects on pain at medium term. No supplements were identified with clinically important effects on pain reduction at long term. Similar results were found for physical function. Chondroitin demonstrated statistically significant, but not clinically important structural improvement (effect size -0.30, -0.42 to -0.17). There were no differences between supplements and placebo for safety outcomes, except for diacerein. The Grading of Recommendations Assessment, Development and Evaluation suggested a wide range of quality evidence from very low to high. CONCLUSIONS: The overall analysis including all trials showed that supplements provided moderate and clinically meaningful treatment effects on pain and function in patients with hand, hip or knee osteoarthritis at short term, although the quality of evidence was very low. Some supplements with a limited number of studies and participants suggested large treatment effects, while widely used supplements such as glucosamine and chondroitin were either ineffective or showed small and arguably clinically unimportant treatment effects. Supplements had no clinically important effects on pain and function at medium-term and long-term follow-ups. Br J Sports Med. 2018 Feb;52(3):167-175. Five Herbs Plus Thiamine Reduce Pain and Improve Functional Mobility in Patients With Pain: A Pilot Study. Context • Five herbs-Urtica dioica (stinging nettle), Boswellia serrata, Equisetum arvense, Allium sativum, and Apium graveolens-have been demonstrated to have activity at several anti-inflammatory pathways and have analgesic properties that are effective in treating chronic musculoskeletal pain. Objectives • The study intended to evaluate the clinical efficacy of a proprietary blend of U dioica, B serrata, E arvense, A sativum, A graveolens, and thiamine (vitamin B1), or "the blend," in the treatment of chronic musculoskeletal pain. Methods • The research team performed a prospective case study. Setting • The study took place at the National Center for Whole Psychiatry in Chevy Chase, MD, USA. PARTICIPANTS: Participants were patients who had experienced baseline persistent musculoskeletal pain for at least 4 mo in ≥1 body parts without relief from traditional treatments. Intervention • Participants were provided with a 14-d supply of the study's medication. Two 350-mg capsules were administered 2 ×/d with food. The participants were instructed not to alter or add any therapies for their pain-associated condition for the 14 d of the study. Outcome Measures • The primary outcome measure was the change on a subjectively scored visual analogue scale (VAS), similar to the Western Ontario and McMaster Universities Osteoarthritis Index. The VAS was used to assess pain and the impact of motion and mobility at each location with pain. Each patient was administered the VAS rating scale to assess physical function and pain status at baseline and at the end of 14 d or postintervention. Patients were seen for follow-up at a minimum of 2 wk and underwent an interview, with the VAS rating scale being readministered. Results • A total of 13 patients, involving 27 pain sites, qualified for the study, 5 males and 8 females with a median age of 58 y. The primary sites of pain were (1) the knees-5 sites (18.5%), (2) the shoulders-6 sites (16.6%), and (3) the back (sciatica)-5 sites (18.5%), with 11 miscellaneous locations (40.7%) making up the rest of the sites, including the neck, jaw, foot, heel, and coccyx. The mean disease duration was 5.61 y, with a range of 4 mo to 20 y. The average VAS pain subscale score was 58.04 at baseline and 23.33 at follow-up. The mean difference between the 2 scores was 34.71 (confidence interval [CI], 26.16-47.01). A significant reduction in the pain scores had occurred by the follow-up assessment (t = 7.23, P < .05). The average VAS subscale score for functional mobility was 56.67 at baseline and 28.70 at follow-up. The mean difference between the 2 mobility scores was 27.97 (CI, 17.86-38.88). A significant improvement in the ability to move had occurred in the affected areas by the follow-up assessment (t = 5.97, P < .05). No adverse effects were reported. Conclusions • A clinically significant reduction in perceived pain and improvement in functional mobility had occurred for the intervention group as related to their chronic joint, back, and muscle pain. The complex of 5 herbs, plus vitamin B1, was well tolerated, and the results suggest that the blend should be considered to be a valuable alternative treatment in the management of chronic musculoskeletal pain. Altern Ther Health Med. 2017 Jan;23(1):14-19. Movardol® (N-acetylglucosamine, Boswellia serrata, ginger) supplementation in the management of knee osteoarthritis: preliminary results from a 6-month registry study. OBJECTIVE: Knee Osteoarthritis (OA) is a chronic disease caused by the deterioration of cartilage in joints, which results in activation of the inflammatory response, pain, and impaired movement. Complementary therapies, particularly supplementation, in the management of moderate/severe knee OA have been gaining attention. This registry study aimed at evaluating the synergistic effect of Movardol®, a supplementation containing active ingredients with recognized anti-inflammatory activities on symptoms and levels of circulating biomarkers of knee OA. PATIENTS AND METHODS: 54 subjects with symptomatic, moderate knee OA freely decided to follow either a standard management (SM) (n = 26) or SM plus oral supplementation with Movardol® (n = 28). Movardol® supplementation containing N-acetyl-D-glucosamine, ginger, and Boswellia Serrata extract was taken at the following dosage: 3 tablets/day for one week and then 2 tablets/day. Several parameters were assessed at inclusion and after 1, 3 and 6 months: functional impairment by the Karnofsky Performance Scale Index; pain, stiffness, physical, social and emotional functions by the Western Ontario and McMaster Universities Osteoarthritis Index (WOMAC); total and pain-free walking distance; circulating biomarkers of inflammation and oxidative stress. RESULTS: Significant improvements in the functional outcomes and pain-free walking distance were observed after 1, 3 and 6 months in OA patients supplemented with Movardol®. Moreover, all the signs/symptoms of disease assessed by the WOMAC tended to regress over a 6-month period in patients following SM+supplementation. Inflammatory markers and plasmatic content of reactive oxygen species decreased over 6 months, in supplemented patients. Movardol® supplementation resulted to be safe and well tolerated, also showing the beneficial effect in term of a decrease in pharmacological and non-pharmacological treatments and, consequently, reduction in management costs. CONCLUSIONS: These preliminary results indicate the efficacy and safety of Movardol® supplementation in the management of moderate knee OA. Eur Rev Med Pharmacol Sci. 2016 12;20(24):5198-5204. In Vivo Osteoinduction: Evaluating 2-Beta Coxatene as an Immunoinductive Compound and Novel Ingredient for Joint Support. CONTEXT: Osteoarthritis (OA) is a degenerative joint disease characterized by progressive loss of articular cartilage. Many treatments lack the ability to stimulate the growth of native cartilage tissue while they simultaneously increase joint comfort. For the past few decades, dietary supplements have been investigated for the ability to both address joint inflammation and stimulate cartilage tissue. OBJECTIVES: The present study intended to examine the supplement's in vivo osteoinductive capabilities and clinical efficacy for overall joint health. DESIGN: The research team designed a randomized, double-blind, comparative clinical trial. SETTING: The study took place via telephone interviews. PARTICIPANTS: Participants had self-reported OA of a weight-bearing joint (ie, of the knee, hip, spine, or ankle). Patients were recruited using the Health Science Institute, a consumer supplement newsletter. INTERVENTION: Participants in the intervention group were blindly given 135 mg of 2-Beta Coxatene (2BCT) orally, which contained (1) a custom blend of low-dose Cyplexinol, an osteoinductive protein complex derived from bovine bone tissue, and (2) resin enriched to 65% 3--Acetyl-11-keto-β-Boswellic acid. A positive control group was blindly given 1500 mg of glucosamine hydrogen chloride and 1200 mg of chondroitin sulfate. Participants took the supplements for 3 mo. OUTCOME MEASURES: A histological evaluation was performed on an athymic rat to test the supplement's in vivo osteoinductive capabilities. A negative control, commercially purchased, unhydrolyzed type 2 collagen was used for that test. Participants were evaluated for parameters of pain and joint function at baseline (day 0) and at days 7, 30, and 90 using the Western Ontario and McMaster Universities (WOMAC) OA index and a visual analogue scale (VAS). RESULTS: The histological evaluation of the athymic rat confirmed that the Cyplexinol component of the 2BCT was positive for de novo bone tissue and collagen synthesis, corroborating osteoinduction. In the clinical trial, the intervention group reported significant decreases of 57.4%, 52.5%, and 58% in normalized WOMAC scores for pain, stiffness, and joint functionality, respectively, from baseline to postintervention. The control group reported a decrease of 17.5%, 18.1%, and 23.9% for pain, stiffness, and joint functionality, respectively. For the intervention group, pain intensity and frequency, as measured by the VAS, also decreased 57.1% and 56.3%, respectively, from baseline to postintervention, whereas the control group showed a decrease in VAS scores of 18.0% and 14.8%, respectively. In total, an average of 81.2% of participants administered the 2BCT had reported a statistically significant improvement from baseline to postintervention, compared with 22.9% of participants administered glucosamine and chondroitin. CONCLUSIONS: In vivo studies confirmed that the bioactive proteins (Cyplexinol) within the 2BCT stimulated de novo bone and cartilage tissue production, demonstrating osteoinduction. The intervention group reported greater improvements in the psychometric evaluations that assessed joint comfort when compared with participants given the glucosamine and chondroitin. The results suggest that 2BCT may provide a novel and synergistic response to preserving joint homeostasis and improving quality of life. Integr Med (Encinitas). 2016 Oct;15(5):34-44. Clinical comparison of oral administration and viscosupplementation of hyaluronic acid (HA) in early knee osteoarthritis. PURPOSE: Osteoarthritis (OA) is a progressive, chronic and degenerative joint disease characterized by a loss of articular cartilage. Treatment of OA is largely palliative based on nonsteroidal anti-inflammatory drugs, opioids and injections of steroids. Regarding conservative treatment, intra-articular injections of hyaluronic acid (HA) can play a role in early symptomatic knee OA. MATERIALS AND METHODS: Between August 2015 and September 2015, sixty patients (32 males and 28 females) between 40 and 70 years old were randomly allocated into two groups: Half were treated with three weekly intra-articular injections of hyaluronic acid 1.6 % (group A), while the others were treated with Syalox 300 Plus (hyaluronic acid 300 mg + Boswellia serrata extract 100 mg) 1 tab/die for 20 days and afterward Syalox 150 (hyaluronic acid 150 mg) 1 tab/die for other 20 days (group B). All patients were evaluated clinically with American Knee Society Score (AKSS) and visual analogue scale (VAS) for the pain before the treatment and after 3 months. RESULTS: AKSS of the patients in both groups was significantly increased by the treatment, and VAS score was significantly reduced. In both groups, two subgroups were created with patients older than 60 years and patients younger than 60 years. Better results are reported in younger patients of group A and older subjects in group B. CONCLUSIONS: Despite several limitations, the results of the study have shown that HA injection and oral administration may have beneficial therapeutic effects on patients with early osteoarthritis. Different outcomes in younger and older subject suggested a combined therapy first with local infiltrations and then with oral composition. Methylsulfonylmethane and boswellic acids versus glucosamine sulfate in the treatment of knee arthritis: Randomized trial. Until now glucosamine sulfate (GS) has been the most widely used supplement and has been shown to be efficacious in the treatment of osteoarthritis (OA). Methylsulfonylmethane (MSM) and boswellic acids (BA) are new effective supplements for the management of inflammation and joint degeneration, according to previous experimental studies. The aim of our study is to test the effectiveness of association of MSM and BA in comparison with GS in knee arthritis.In this prospective randomized clinical trial, MEBAGA (Methylsulfonylmethane and Boswellic Acids versus Glucosamine sulfate in the treatment of knee Arthritis), 120 participants affected by arthritis of the knee were randomly assigned to an experimental group (MB group) or a control group (GS group) treated for 60 days with 5 g of MSM and 7.2 mg of BA or with 1500 mg of GS daily, respectively. At the 2-month (T1) and 6-months (T2) follow-up , the efficacy of these two nutraceuticals was assessed using the visual analog pain scale (VAS) and the Lequesne Index (LI) for joint function, along with the use of anti-inflammatory drugs (non-steroidal anti-inflammatory drugs and anti-cyclooxygenase-2).The repeated measures ANOVA analysis shows that for VAS, LI, and the use of anti-inflammatory drugs scores there are improvements due to the time in the two groups (respectively, F=26.0; P<0.0001; F=4.15; P=0.02; F=3.38; P=0.04), with a tendency to better values for the MB group at T2.On the basis of these preliminary data, we could support the efficacy of the MSM in association with BA in the treatment of OA. These results are consistent with the anti-inflammatory and chondroprotective effects previously occurred in experimental studies. This new combination of integration (MSM and BS) has presented good results and satisfactory in comparison with GS, until now the cornerstone of the treatment of arthritis in according to guidelines. Int J Immunopathol Pharmacol. 2016 Mar;29(1):140-6. Minerva Gastroenterol Dietol. 2015 Oct;():. Management of osteoarthritis (OA) with the pharma-standard supplement FlexiQule (Boswellia): a 12-week registry. This registry study assessed the pharma-standard supplement FlexiQule (Boswellia extract in capsules) in the management of symptoms associated to osteoarthritis (OA) also managed with the 'standard management' (SM) in comparison with a group of patients managed only with SM. The 12- week registry included patients with symptomatic knee arthrosis. They were able to walk on a treadmill for a walking test and to complete the WOMAC questionnaire. RESULTS: 32 patients used the supplement and 34 acted as controls (SM). No safety problems were observed. At 12 weeks, the Karnofsky scale was significantly improved in both groups: the variation was higher (p<0.05) in the supplement group. The WOMAC score was decreased significantly more in the supplement+SM group in comparison with controls considering pain, stiffness and physical functions (p<0.05). For social and emotional functions the decrease in score was also more evident in the supplement group (p<0.05). Both groups improved in pain-free and total walking distance at 12 weeks. Pain-free walking distance (treadmill) was higher (p<0.05) with the supplement (from 93.4;11.6 m to 271.3;19.3 m) than in controls (from 90.5;13.5 m to 158.3;22.3)(p<0.05). The improvement in total walking distance was also higher in the supplement group (p<0.05) (from 164.3;23.2 to 322.3;22.3 m) in comparison with the SM- only group ( from 158.3;18,4 to 240.2;19.3 m). The need for concomitant drugs and medical attention during the registry was reduced more in the supplement group (p<0.05). In conclusion the difference between SM and the Flexiqule+SM was in favor of the management with the supplement for all target measurements. The product is safe and well tolerated. Effect of Sri Lankan traditional medicine and Ayurveda on Sandhigata Vata (osteoarthritis of knee joint). Reported case was a 63-year-old female with end-stage osteoarthritis (OA) (Sandhigata Vata) of the left knee joint accompanied by exostoses. Radiology (X-ray) report confirmed it as a Kellgren-Lawrence grade III or less with exostoses. At the beginning, the Knee Society Rating System scores of pain, movement and stability were poor, and function score was fair. Srilankan traditional and Ayurveda medicine treatment was given in three regimens for 70 days. After 70 days, external treatment of oleation and 2 capsules of Shallaki (Boswellia serrata Triana and Planch) and two tablets of Jeewya (comprised of Emblica officinalis Gaertn., Tinospora cordifolia [Willd.] Millers. and Terminalia chebula Retz. ), twice daily were continued over 5 months. Visual analogue scale for pain, knee scores in the Knee Society online rating system and a Ayurveda clinical assessment criteria was used to evaluate the effects of treatments in weekly basis. After treatment for 70 days, the Knee Society Rating System scores of pain, movement and stability were also improved up to good level and function score was improved up to excellent level. During the follow-up period, joint symptoms and signs and the knee scores were unchanged. In conclusion, this OA patient's quality of life was improved by the combined treatment of Sri Lankan traditional medicine and Ayurveda. FlexiQule (Boswellia extract) in the supplementary management of osteoarthritis: a supplement registry. UNLABELLED: The aim of the present pilot, registry study was an assessment in a supplement study of FlexiQule (standardized Boswellia extract) capsules in the supplementary management of patients with symptomatic knee osteoarthritis (OA) also treated with the "standard management" (SM) in comparison with a group of patients only managed with SM. METHODS: This 4-week study included patients with symptomatic knee arthrosis (X-ray). Registry subjects were able to perform a treadmill walking test and to understand questions from the WOMAC questionnaire. Exclusion criteria were conditions requiring drug treatment, Body Mass Index >25, metabolic disorders, surgery within three months prior to inclusion, oncological condition or inability to walk. RESULTS: Twenty-seven registry subjects using the supplement+SM and 28 using only SM completed the registry; at inclusion, the two groups were comparable including Karnofsky scale, WOMAC Score and the Treadmill Test. Of the subjects completing the registry 24 preferred to use the combination SM and the supplement. Safety evaluation: no problems - indicating the suspension of the supplementation ‑ were observed. Routine blood tests were normal at inclusion and did not significantly vary at 4 weeks. The Karnofski Scale at 4 weeks was improved in both groups: from 74.3;3.1 to 88.9;5.3 (P<0.05) in the Boswellia group in comparison with a variation from 75.3;5.2 to 79.4;3.3 (P<0.05) in the SM. The effects of the supplement were significantly higher (P<0.05). The WOMAC Score was decreased significantly more in the supplement+SM group in comparison with controls considering pain, stiffness and physical functions (P<0.05). Social/emotional functions improved better with the supplement (P<0.05). Both groups improved their walking distance at 4 weeks. The improvement was higher (P<0.05) in the Boswellia group. The need for other drugs or tests during the registry period was reduced more in the supplement group (P<0.05). CONCLUSION: The difference between SM and the supplementation associated to SM was significant) in favor of the supplementation with Boswellia for all target measurements evaluated in the registry at 4 weeks. Minerva Med. 2014 Dec;105(6 Suppl 2):9-16. Co-analgesic therapy for arthroscopic supraspinatus tendon repair pain using a dietary supplement containing Boswellia serrata and Curcuma longa: a prospective randomized placebo-controlled study. MATERIALS AND METHODS: This was a prospective randomized trial designed to assess the analgesic effect of a dietary supplement (DS) containing Boswellia serrata and Curcuma longa in a population of subjects with full-thickness SSP tendon tear treated by arthroscopy. Three weeks before surgery, patients were randomized to receive Tendisulfur(®) (group T) or a placebo (group P) for 2 months. The primary outcome measure was subjective VAS pain. Secondary outcomes measures were Constant-Murley score simple shoulder test, and patient global assessment (PGA) scores. Patients were assessed immediately at baseline and subsequently at 1, 2, 4, 6, 8, 12, and 24 weeks. RESULTS: Stratification of pain scores and subscores demonstrated significantly lower overall pain scores in group T versus group P at 1 week (p = 0.0477), and lower but not significantly different scores on week 2 (p = 0.0988); at subsequent time points, differences were not significant (p > 0.05). PGA scores were good in all subjects. CONCLUSIONS: In conclusion, this study provides objective data on the effect of a DS containing natural substances, added to standard analgesics, on postoperative RC pain. DS alleviated short and partially mid-term pain, while long-term pain was unchanged. This limitation can probably be addressed by a dosage increase over the first 4 weeks and by extending treatment by 1 or 2 months. Musculoskelet Surg. 2015 Sep;99 Suppl 1():S43-52. A medicinal herb-based natural health product improves the condition of a canine natural osteoarthritis model: a randomized placebo-controlled trial. An oral herb-based natural health product (NHP) was evaluated in the canine natural osteoarthritis model. At baseline, the peak vertical force (PVF, primary endpoint) and case-specific outcome measure of disability (CSOM) were recorded in privately-owned dogs. Dogs (16/group) were randomized to receive NHP formulations or a negative control. The PVF was measured at week (W) 4 and W8. Daily locomotor activity was recorded using accelerometer. The CSOMs were assessed bi-weekly by the owner. The NHP-treated dogs (n = 13) had higher PVF at W4 (p = 0.020) and W8 (p <0.001) when compared to baseline. The changes at W8 were higher than control dogs (n = 14, p <0.027) and consistent with Cohen's d effect size of 0.7 (95% confidence interval: 0.0-1.5). The NHP-treated dogs had higher locomotor activity at W8 (p = 0.025) when compared to baseline. No significant change was observed for the CSOM. The NHP improved the clinical signs of osteoarthritis in this model. Res Vet Sci. 2014 Dec;97(3):574-81. A commercialized dietary supplement alleviates joint pain in community adults: a double-blind, placebo-controlled community trial. BACKGROUND: The purpose of this study was to assess the effect of 8-weeks ingestion of a commercialized joint pain dietary supplement (Instaflex™ Joint Support, Direct Digital, Charlotte, NC) compared to placebo on joint pain, stiffness, and function in adults with self-reported joint pain. Instaflex™ is a joint pain supplement containing glucosamine sulfate, methylsufonlylmethane (MSM), white willow bark extract (15% salicin), ginger root concentrate, boswella serrata extract (65% boswellic acid), turmeric root extract, cayenne, and hyaluronic acid. METHODS: Subjects included 100 men and women, ages 50-75 years, with a history (>3 months) of joint pain, and were randomized to Instaflex™ or placebo (3 colored gel capsules per day for 8 weeks, double-blind administration). Subjects agreed to avoid the use of non-steroidal anti-inflammatory drugs (NSAID) and all other medications and supplements targeted for joint pain. Primary outcome measures were obtained pre- and post-study and included joint pain severity, stiffness, and function (Western Ontario and McMaster Universities [WOMAC]), and secondary outcome measures included health-related quality of life (Short Form 36 or SF-36), systemic inflammation (serum C-reactive protein and 9 plasma cytokines), and physical function (6-minute walk test). Joint pain symptom severity was assessed bi-weekly using a 12-point Likert visual scale (12-VS). CONCLUSIONS: Results from this randomized, double blind, placebo-controlled community trial support the use of the Instaflex™ dietary supplement in alleviating joint pain severity in middle-aged and older adults, with mitigation of difficulty performing daily activities most apparent in subjects with knee pain. Clinical evaluation of a formulation containing Curcuma longa and Boswellia serrata extracts in the management of knee osteoarthritis. Mol Med Rep. 2013 Nov;8(5):1542-8. Ayurvedic medicine offers a good alternative to glucosamine and celecoxib in the treatment of symptomatic knee osteoarthritis: a randomized, double-blind, controlled equivalence drug trial. OBJECTIVE: To demonstrate clinical equivalence between two standardized Ayurveda (India) formulations (SGCG and SGC), glucosamine and celecoxib (NSAID). METHODS: Ayurvedic formulations (extracts of Tinospora cordifolia, Zingiber officinale, Emblica officinalis, Boswellia serrata), glucosamine sulphate (2 g daily) and celecoxib (200 mg daily) were evaluated in a randomized, double-blind, parallel-efficacy, four-arm, multicentre equivalence drug trial of 24 weeks duration. A total of 440 eligible patients suffering from symptomatic knee OA were enrolled and monitored as per protocol. Primary efficacy variables were active body weight-bearing pain (visual analogue scale) and modified WOMAC pain and functional difficulty Likert score (for knee and hip); the corresponding a priori equivalence ranges were ±1.5 cm, ±2.5 and ±8.5. RESULTS: Differences between the intervention arms for mean changes in primary efficacy variables were within the equivalence range by intent-to-treat and per protocol analysis. Twenty-six patients showed asymptomatic increased serum glutamic pyruvic transaminase (SGPT) with otherwise normal liver function; seven patients (Ayurvedic intervention) were withdrawn and SGPT normalized after stopping the drug. Other adverse events were mild and did not differ by intervention. Overall, 28% of patients withdrew from the study. CONCLUSION: In this 6-month controlled study of knee OA, Ayurvedic formulations (especially SGCG) significantly reduced knee pain and improved knee function and were equivalent to glucosamine and celecoxib. The unexpected SGPT rise requires further safety assessment. TRIAL REGISTRATION: Clinical Drug Trial Registry-India, www.ctri.nic.in, CTRI/2008/091/000063. Clinical evaluation of Boswellia serrata (Shallaki) resin in the management of Sandhivata (osteoarthritis). A double blind, randomized, placebo controlled clinical study evaluates the early efficacy of aflapin in subjects with osteoarthritis of knee. Aflapin(®) is a novel synergistic composition derived from Boswellia serrata gum resin (Indian Patent Application No. 2229/CHE/2008). Aflapin is more efficacious as an anti-inflammatory agent compared to the existing Boswellia products, 5-Loxin(®) and traditional 65% Boswellia extract. A 30-day, double-blind, randomized, placebo-controlled study was conducted to validate the efficacy of Aflapin(®) in the management of clinical symptoms of osteoarthritis (OA) of the knee (Clinical trial registration number: ISRCTN69643551). Sixty eligible OA subjects selected through screening were included in the study. The subjects received either 100 mg (n=30) of Aflapin(®) or placebo (n=30) daily for 30 days. Each subject was evaluated for pain and physical functions by using the standard tools (visual analog scale, Lequesne's Functional Index, and Western Ontario and McMaster Universities Osteoarthritis Index) at the baseline (day 0), and at days 5, 15 and 30. A series of biochemical tests in serum, urine and hematological parameters established the safety of Aflapin. The observations suggest that Aflapin conferred clinically and statistically significant improvements in pain scores and physical function scores in OA subjects. Aflapin provided significant improvements in pain score and functional ability in as early as 5 days of treatment. In conclusion, our observations suggest that Aflapin is a safe, fast acting and effective alternative intervention in the management of OA. 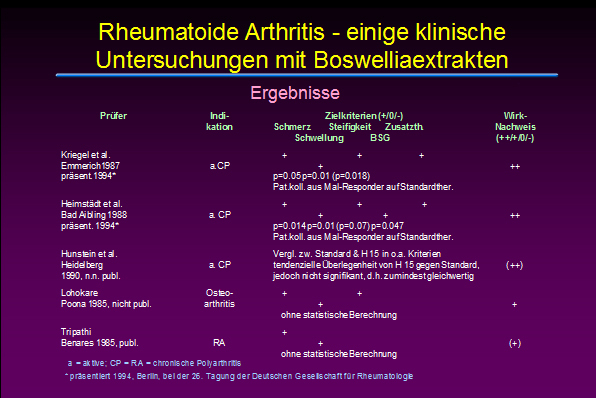 INTRODUCTION: Osteoarthritis is a chronic rheumatoid disease mediated by metalloproteinases and inflammatory cytokines. Methylsulfonylmethane (MSM) and boswellic acids (BA) each show promise in the treatment of inflammatory processes, but the efficacy of combined treatment with these substances in the treatment of arthritis has not yet been studied. METHODS: In this prospective randomized clinical trial, MESACA (for "methylsulfonylmethane and boswellic acids in the treatment of knee arthritis"), 60 subjects affected by arthritis of the knee were randomly assigned to an experimental group treated for 60 days with 5 g of MSM and 7.2 mg of BA daily, or a control group which was administered a placebo. At 2 and 6 months follow-up (FU), the efficacy of combined treatment with these two dietary supplements was assessed using the visual analog pain scale (VAS) and the Lequesne index (LI) for joint function, as well as monitoring the use of anti-inflammatory drugs (nonsteroidal anti-inflammatory drugs and anti-cyclooxygenase-2). 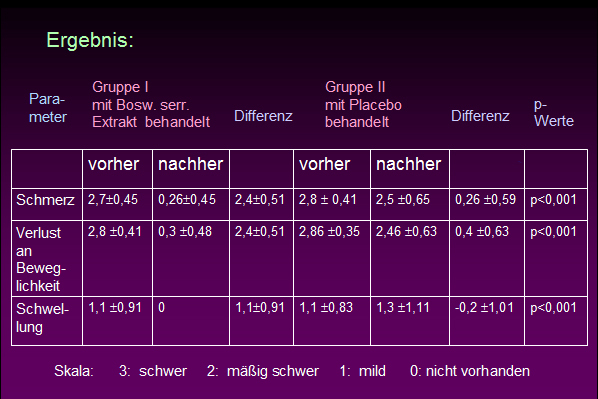 RESULTS: Pain, assessed with the VAS scale, was worse in the group treated with MSM and BA as compared with the placebo group at 2 months FU (3.8 vs. 2.7; P=0.04), whereas no difference between the two groups was observed at 6 months FU (2.7 vs. 3.6; P=0.2). No statistically significant differences were found in the LI between the two groups at either FU (2 months: 4.8 vs. 4.2; P=0.51; 6 months: 4.4 vs. 4.5; P=0.91). By contrast, a statistically significant difference in patients need for anti-inflammatory drugs was seen in the experimental as compared to the placebo group, even by 2 months FU (0.2 vs. 0.6 tablets/day; P<0.0001), that persisted up to the end of the study (0.1 vs. 0.6 tablets/day; P<0.0001). CONCLUSIONS: Although the combined administration of MSM and BA in the treatment of gonarthrosis was not shown to be more efficacious than placebo in the management of the clinical and functional picture, it significantly reduced patients need for anti-inflammatory drugs. Antiarthritic activity of a standardized, multiherbal, Ayurvedic formulation containing Boswellia serrata: in vitro studies on knee cartilage from osteoarthritis patients. A validated in vitro model of cartilage damage and published data were used showing that this model measures the chondroprotective and antiinflammatory effects of different antiarthritic drugs. In this report, this model was used to evaluate the effects of a new antiarthritic Ayurvedic formulation containing Zingiber officinale root, Tinospora cordifolia stem, Phyllanthus emblica fruit and oleoresin of Boswellia serrata. Glucosamine sulphate was used as a positive control in the study. Aqueous extracts of each drug were tested on explant cultures of knee cartilage obtained from osteoarthritis patients undergoing knee replacement surgery. The new formulation caused a sustained and statistically significant inhibition in the release of glycosaminoglycans and aggrecan by cartilage explants from these patients. This formulation also induced a transient antiinflammatory effect as measured by a reduction in the levels of nitric oxide released by explants. Furthermore, the data strongly suggest that oleoresin of B. serrata plays a crucial role in the chondroprotective and antiinflammatory activity of this formulation. In summary, this report provides the first, direct, in vitro biochemical evidence of anti-arthritic activity a new Ayurvedic formulation. This formulation significantly reduced damage of articular knee cartilage from chronic osteoarthritis patients. Comparative efficacy and tolerability of 5-Loxin and AflapinAgainst osteoarthritis of the knee: a double blind, randomized, placebo controlled clinical study. Aflapin(®) is a novel synergistic composition derived from Boswellia serrata gum resin (Indian Patent Application No. 2229/CHE/2008). Aflapin is significantly better as an anti-inflammatory agent compared to the Boswellia extracts presently available in the market. A 90-day, double-blind, randomized, placebo-controlled study was conducted to evaluate the comparative efficacy and tolerability of 5-Loxin(®) and Aflapin(®) in the treatment of osteoarthritis (OA) of the knee (Clinical trial registration number: ISRCTN80793440). Sixty OA subjects were included in the study. The subjects received either 100 mg (n=20) of 5-Loxin(®) or 100 mg (n=20) of Aflapin(®) or a placebo (n=20) daily for 90 days. Each patient was evaluated for pain and physical functions by using the standard tools (visual analog scale, Lequesne's Functional Index, and Western Ontario and McMaster Universities Osteoarthritis Index) at the baseline (day 0), and at days 7, 30, 60 and 90. A battery of biochemical parameters in serum, urine and hematological parameters in citrated whole blood were performed to assess the safety of 5-Loxin(®) and Aflapin(®) in OA subjects. Fifty seven subjects completed the study. At the end of the study, both 5-Loxin(®) and Aflapin conferred clinically and statistically significant improvements in pain scores and physical function scores in OA subjects. Interestingly, significant improvements in pain score and functional ability were recorded as early as 7 days after initiation of the study in the treatment group supplemented with 100 mg Aflapin. Corroborating the improvements in pain scores in treatment groups, our in vitro studies provide evidences that Aflapin(®) is capable of inhibiting cartilage degrading enzyme MMP-3 and has the potential to regulate the inflammatory response by inhibiting ICAM-1. Aflapin(®) and 5-Loxin(®) reduce pain and improve physical functions significantly in OA subjects. Aflapin exhibited better efficacy compared to 5-Loxin(®). In comparison with placebo, the safety parameters were almost unchanged in the treatment groups. Hence both 5-Loxin(®) and Aflapin(®) are safe for human consumption. Int J Med Sci. 2010 Nov;7(6):366-77. INTRODUCTION: 5-Loxin is a novel Boswellia serrata extract enriched with 30% 3-O-acetyl-11-keto-beta-boswellic acid (AKBA), which exhibits potential anti-inflammatory properties by inhibiting the 5-lipoxygenase enzyme. A 90-day, double-blind, randomized, placebo-controlled study was conducted to evaluate the efficacy and safety of 5-Loxin in the treatment of osteoarthritis (OA) of the knee. METHODS: Seventy-five OA patients were included in the study. The patients received either 100 mg (n = 25) or 250 mg (n = 25) of 5-Loxin daily or a placebo (n = 25) for 90 days. Each patient was evaluated for pain and physical functions by using the standard tools (visual analog scale, Lequesne's Functional Index, and Western Ontario and McMaster Universities Osteoarthritis Index) at the baseline (day 0), and at days 7, 30, 60 and 90. Additionally, the cartilage degrading enzyme matrix metalloproteinase-3 was also evaluated in synovial fluid from OA patients. Measurement of a battery of biochemical parameters in serum and haematological parameters, and urine analysis were performed to evaluate the safety of 5-Loxin in OA patients. RESULTS: Seventy patients completed the study. At the end of the study, both doses of 5-Loxin conferred clinically and statistically significant improvements in pain scores and physical function scores in OA patients. Interestingly, significant improvements in pain score and functional ability were recorded in the treatment group supplemented with 250 mg 5-Loxin as early as 7 days after the start of treatment. Corroborating the improvements in pain scores in treatment groups, we also noted significant reduction in synovial fluid matrix metalloproteinase-3. In comparison with placebo, the safety parameters were almost unchanged in the treatment groups. CONCLUSION: 5-Loxin reduces pain and improves physical functioning significantly in OA patients; and it is safe for human consumption. 5-Loxin may exert its beneficial effects by controlling inflammatory responses through reducing proinflammatory modulators, and it may improve joint health by reducing the enzymatic degradation of cartilage in OA patients. CLINICAL TRIAL REGISTRATION NUMBER: ISRCTN05212803.). Curr Opin Pharmacol. 2007 Jun;7(3):344-51. A 32-week randomized, placebo-controlled clinical evaluation of RA-11, an Ayurvedic drug, on osteoarthritis of the knees. BACKGROUND: The ancient Indian (Asian) Ayurvedic medicinal system uses herbomineral drugs to treat arthritis. Despite centuries of use, very few have been tested by drug trials. RA-11 (ARTREX, MENDAR), a standardized multiplant Ayurvedic drug (Withania somnifera, Boswellia serrata, Zingiber officinale, and Curcuma longa) is currently used to treat arthritis. OBJECTIVE: The objective of this study was to evaluate the efficacy and safety of RA-11 in patients with symptomatic osteoarthritis (OA) of the knees. METHODS: A total of 358 patients with chronic knee pain were screened free-of-cost in "arthritis camps" in an Indian metropolis. Ninety patients with primary OA of the knees (ACR classification; Arthritis Rheum 1986;29:1039-1049) were found eligible (postanalgesic washout pain visual analog score [VAS] > or =40 mm in either or both knees on body weight-bearing activities) to enroll into a randomized, double-blind, placebo-controlled, parallel efficacy, single-center, 32-week drug trial (80% power to detect 25% difference, P = 0.05, 2-sided). Concurrent analgesics/nonsteroidal antiinflammatory drugs and steroids in any form were not allowed. Lifestyle and/or dietary restrictions, as per routine Ayurveda practices, were not imposed. Pain VAS (maximum pain in each knee recorded by the patient during the preceding 48 hours) and modified WOMAC (Western Ontario McMaster University OA Index, Likert scale, version 3.0) were the primary efficacy variables. The WOMAC section on "physical function difficulty" was modified for Indian use and validated before the trial. Routine laboratory testing was primarily done to monitor drug safety. At baseline, the groups (active = 45, placebo = 45) were well matched for several measures (mean pain VAS: active = 6.17; placebo = 6.5). RESULTS: 1) EFFICACY: Compared with placebo, the mean reduction in pain VAS at week 16 (active = 2.7, placebo = 1.3) and week 32 (active = 2.8, placebo = 1.8) in the active group was significantly (P <0.05, analysis of variance [ANOVA]) better. Similarly, the improvement in the WOMAC scores at week 16 and week 32 were also significantly superior (P <0.01, ANOVA) in the active group. 2) SAFETY: Both the groups reported mild adverse events (AE) without any significant difference. 3) Withdrawals: Twenty-eight patients were discontinued. None reported drug-related toxicity. The majority failed follow up/compliance. No differences were observed between the groups. CONCLUSION: This controlled drug trial demonstrates the potential efficacy and safety of RA- 11 in the symptomatic treatment of OA knees over 32 weeks of therapy. J Clin Rheumatol. 2004 Oct;10(5):236-45. Dietary support with Boswellia resin in canine inflammatory joint and spinal disease. An open multi-centre veterinary clinical trial, comparing conditions before and after treatment with a herbal dietary supplement consisting of a natural resin extract of Boswellia serrata, was conducted by 10 practicing veterinarians in Switzerland. This traditional plant-based supplement is known for its anti-rheumatic and anti-inflammatory properties. 29 dogs with manifestations of chronic joint and spinal disease were enrolled. Osteoarthritis and degenerative conditions were confirmed radiologically in 25 of 29 cases. The resin extract (BSB108, product of Bogar AG) was administered with the regular food at a dose of 400 mg/10 kg body weight once daily for 6 weeks. Already after two weeks of treatment, an overall efficacy of the dietary supplement was evident in 71% of 24 eligible dogs. A statistically significant reduction of severity and resolution of typical clinical signs in individual animals, such as intermittent lameness, local pain and stiff gait, were reported after 6 weeks. Effects of external factors that aggravate lameness, such as "lameness when moving" and "lameness after a long rest" diminished gradually. In 5 dogs, reversible brief episodes of diarrhea and flatulence occurred, but only once was a relationship to the study preparation suspected. Because quality and stability of the resin extract were ensured, these data suggest that a standardized preparation can be recommended as a herbal dietary supplement providing symptomatic support in canine osteoarthritic disease. Schweiz Arch Tierheilkd. 2004 Feb;146(2):71-9. Efficacy and tolerability of Boswellia serrata extract in treatment of osteoarthritis of knee--a randomized double blind placebo controlled trial. Osteoarthritis is a common, chronic, progressive, skeletal, degenerative disorder, which commonly affects the knee joint. Boswellia serrata tree is commonly found in India. The therapeutic value of its gum (guggulu) has been known. It posses good anti-inflammatory, anti-arthritic and analgesic activity. 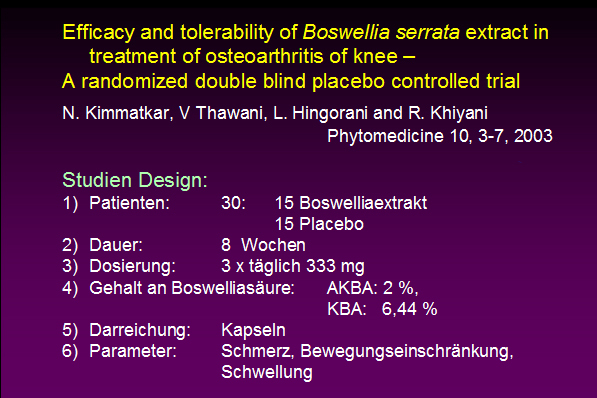 A randomized double blind placebo controlled crossover study was conducted to assess the efficacy, safety and tolerability of Boswellia serrata Extract (BSE) in 30 patients of osteoarthritis of knee, 15 each receiving active drug or placebo for eight weeks. After the first intervention, washout was given and then the groups were crossed over to receive the opposite intervention for eight weeks. All patients receiving drug treatment reported decrease in knee pain, increased knee flexion and increased walking distance. The frequency of swelling in the knee joint was decreased. Radiologically there was no change. The observed differences between drug treated and placebo being statistically significant, are clinically relevant. BSE was well tolerated by the subjects except for minor gastrointestinal ADRs. BSE is recommended in the patients of osteoarthritis of the knee with possible therapeutic use in other arthritis. [Is H15 (resin extract of Boswellia serrata, "incense") a useful supplement to established drug therapy of chronic polyarthritis? Results of a double-blind pilot study]. BACKGROUND: Leukotrienes and prostaglandines are important mediators of inflammation. While prostaglandine synthesis can be influenced by NSAIDs therapeutical approaches to the 5-lipoxygenase pathway are rare. Resinous extracts of Boswellia serrata (H15, indish incense), known from traditional ayurvedic medicine, decrease leukotriene synthesis in vitro. Case reports suggest a clinical role for that drug. METHODS: Outpatients with active RA have been enrolled into a multicenter controlled trial. Patients received 9 tablets of active drug (3600 mg) or placebo daily in addition to their previous therapy. Doses of NSAIDs could be adjusted on demand. Efficacy parameters, Ritchies Index for swelling and pain, ESR, CRP, pain on VAS and NSAID dose were documented at baseline and 6 and 12 weeks after initiation. Mean values and medians were calculated to compare the groups for significant or clinically relevant change from baseline or difference between both groups at any time point of observation. RESULTS: A total of 78 patients were recruited in 4 centers, the data have been published in abstract form. Only 37 patients (verum 18, placebo 19), enrolled in Ratingen were available for detailed efficacy and safety analysis. All evaluations in these patients were performed by one investigator (G.H.). There was no subjective, clinical or laboratory parameter showing a significant or clinically relevant change from baseline or difference between both groups at any time point of observation. The mean NSAID dose reduction reached levels of 5.8% (H15) and 3.1% (placebo). One patient in each group showed a good response in all parameters but 4 patients in each group worsened. The others showed no alteration of their disease. CONCLUSION: Treatment with H15 showed no measurable efficacy. Controlled studies including a greater patient population are necessary to confirm or reject our results. The clinical efficacy of a herbomineral formulation containing roots of Withania somnifera, the stem of Boswellia serrata, rhizomes of Curcuma longa and a zinc complex (Articulin-F), was evaluated in a randomized, double-blind, placebo controlled, cross-over study in patients with osteoarthritis. After a one-month single blind run-in period, 42 patients with osteoarthritis were randomly allocated to receive either a drug treatment or a matching placebo for a period of three months. After a 15-day wash-out period the patients were transferred to the other treatment for a further period of three months. Clinical efficacy was evaluated every fortnight on the basis of severity of pain, morning stiffness, Ritchie articular index, joint score, disability score and grip strength. Other parameters like erythrocyte sedimentation rate and radiological examination were carried out on a monthly basis. Treatment with the herbomineral formulation produced a significant drop in severity of pain (P less than 0.001) and disability score (P less than 0.05). Radiological assessment, however, did not show any significant changes in both the groups. Side effects observed with this formulation did not necessitate withdrawal of treatment.